Ixobelle (archived): I R PvP! 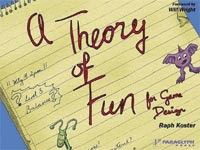 I recently read (and can recommend) Raph Koster's A Theory of Fun for Game Design, and came across a few choice sections regarding frustration vs fun. The book builds up this analysis that games are systems for us to develop and practice skills that help us prepare for real life situations. Gaming presents a fun way to practice these skills where the outcome isn't so critical. At every point in day to day life we're unconsciously jockeying for position on a complex social ladder, but games allow us to relax a bit while we absorb and practice solving abstracted puzzles that 'RL' will present to us. Sometimes it's hard to see the bigger picture. Checkers presents a way to cope with learning about controlling a defined space, or coaxing moves from the other player that benefit us. You can argue whether Checkers is about learning social manipulation skills or not --forcing the opponent to 'waste' their turn to benefit our own agenda-- but it's right there in the game. Anyway, this isn't really a post about the underlying social implications of Checkers. ...fun is contextual. The reasons why we are engaging in an activity matter a lot. School is not usually all that fun because we take it seriously -- it's not practice, it's for real, and your grades and social standing and clothing determine whether you are in the in-crowd or whether you sit at the table close to the cafeteria kitchen. It's very telling that when we lose a competition, we often say, "Well, I was just doing it for fun." The implication is that we are shrugging off the implicit loss of social status inherent in a loss. Since it was merely a form of practice, perhaps we didn't put forth our best effort. As I read this passage, I immediately thought of my justifications for not really engaging too seriously in WoW's PvP offerings, and especially Arena. Back when Welfare Epics were in vogue, I would faceroll my ten games for the week, and "didn't care whether I won or not". I was horrible at PvP, and would therefore discount it by saying I didn't really care about the outcome. PvP brings its own unique psychology to the table as well, where in PvE you generally 'feel like a hero most of the time'. In PvP, I'm generally 'dead most of the time'. I recently got one of my old roommates to bring a shaman over to Pro'gall for PVEing mostly, but one night we decided to go ahead and form up a 2v2 team; because what the hell, right? We promptly went 0-10 with his shaman and my rogue using full PVE gears. It was frustrating, and I found myself saying over vent that I just didn't care. I even made the connection right then and there what I was doing. I had just read the page I quoted maybe the night before we began. I was determined to consciously overcome my disdain for losing. At the same time, it was exciting to be engaging in a new set of pattern solving within a system I was so familiar with (WoW, or even 'healing within WoW using a priest'). If your car could suddenly fly starting tomorrow, it would be a weird adjustment to deal with having the steering wheel also be a yoke, while all at the same time you're still sitting in the driver seat of your 83 Corolla. I decided to throw myself into it (I tend to min/max, and am usually all in or not in at all), and decided that my priest was a better fit for the Arena, as with a rogue I felt I didn't have as much influence on events. Since then I've needed to absorb a whole new system of dealing with how to drive my Priest, and it's been a blast. I'm apparently such a horrible priest that I didn't even realize Dispel has offensive applications. I didn't even have it on my bar, since I used SmartDebuff to remove poisons and magic effects, and only on teammates; never while targeting a hostile. Anyway, my buddy Jacob and I have been plugging away at it for a couple of days now, and are getting better at actually using cooldowns instead of dying with things like Hex, Pain Suppression, and Power Infusion going unused. We're moving up to the big leagues now in the 2v2 bracket, I think we hit 316 rating last time we had a go. Since switching to my priest, we've been winning more than before, and most important of all, we're embracing the fact that we have no idea what we're doing, and having fun learning this new system. That mentality can apply to so many things... respeccing to that one tree you never bothered with, or embracing a play style that you never really checked out (dps vs tanking vs healing). It certainly doesn't only apply to MMOs, either. Try to consciously be on the lookout for any time you're dismissing something because you "just don't care"... do you REALLY not care, or you afraid of having to learn something new? Learning is fun, but we're naturally inclined to fall into routines of doing things we've already learned... things we already know how to do. It's good to rock the boat. I'm actually really enjoying my priest again after having switched to my rogue, and am especially finding new enjoyment in the challenge PvP healing is offering me. I healed PvE for a long time, but my car can suddenly fly now, and it's a whole new world. That book is amazingly insightful. I read it over the summer while participating in an experimental game design class Ian Schreiber decided to do this summer. When/if I get done with my RP project I would definitely like to rock my boat again, trying PvP. I just need to find another noob to convince to join me in my mission impossible. PvP, is pretty much an entirely different game than PvE. www.sk-gaming.com Use the sortable top 100 list to look at different talent specs/gem/enchant strategies being used by successful Players of your class! This can really be very helpful. This is probably my favorite resource! It is a pay site, (~$5 a month, and I'm not being paid to say it and have no affiliation to the management) which features class tutorial videos, comp videos, and forums which are the most helpful I have found anywhere. Plus, Gladiators will actually respond to your posts NICELY! It's amazing that not everyone in the arena scene is a nerd raging ***hole. Finally, although no arena guru myself, (Hit 1800 on a few toons and stopped after I had weapons, my heart is with the BGs!) I have played a disc priest in arena, and would be happy to chat about some strats with you sometime! "do you REALLY not care, or you afraid of having to learn something new?" I really like this, because it's very, very true. Tobold dislikes PvP because he says he can't deal with the "twitchiness" of it. So he doesn't care. He doesn't want to learn to be better. I played WoW for a couple years and my whole purpose in playing was to PvP. I loved it. I did PvE just to remain competitive in PvP. When I first started playing the game PvP was very nerve-wracking and sent me into fits of anxiety (this was back in the days before battlegrounds and the honor system, when PvPing was essentially just ganking or being ganked in the world). And I found myself falling back on excuses like "well I don't care." I'd find myself being afraid to attack someone because if I put forth the effort and failed, it meant I was deficient. Better not to try, right? Not really. It's very rewarding to learn something. Even if you aren't great at it. Who cares? Someone is always better. And eventually I established myself as one of the top PvPers on my server. Nowadays I get my "PvP" fix with games like Bad Company 2, but it's the same thing. It's very intimidating, at first. But pushing through it is always worthwhile. Testing yourself never does more harm than good. I am so with you! I really am terrible at PvP generally speaking, but I had a time during which a friend and I decided to brave the arenas and embrace the dying. It was SUCH a different game! We actually had to use strategy, think about what things would work, what wouldn't depending on who/what we were fighting. Oh so much fun! To think and puzzle through things in WoW again! Joy of joys! Sadly, that friend no longer plays, so my arena days are no more, but... well, I'll just have to find me another play buddy who's willing to fail a lot, I think. Hah.. I would do Arena with you Lantana. I've been out of practice for about 2 years so I'm sure my level of fail would far exceed yours. I would, if I weren't terrified of being sucked back into WoW all over again. Detoxing was difficult enough the first time around! Aw, man, i SO care ! The carecup is overflowing. The care police arrested me and they're beating me up in the interrogation room. Recently i was talking to someone that only plays for PvE. She just wanted to go about her business and never skirmish with the opposing faction, and couldn't understand why some people corpse camp or kill quest givers or whatnot, the so called griefers. So I did my best to impersonate Samuel L Jackson in 51st State and told her "there's a war going on out there man... A WAR...!" See, i couldn't ever get rid of that, i'm an old timer, by default i want to stomp anyone that rolls human/gnome/night elf/blood elf/draenei. PvP was what made WoW the winner for me, it was truly epic. I can still remember old vanilla feuds with the allies, 8-hour long AVs and WSGs won 3-2 after 2 hours of struggle. See, PvP was like, i dunno, cookies, you'd wait quite a lot to get it, and when you did you tried to make the best of it. Of course, i got disgusted by the way pvp evolved, but i still wouldn't have WoW without it. No one was born a pvp master, hell, i did my share of fuckups, i still find myself playing old school conservative way ("oh, uhm, let's gouge and try to restealth and sap between dots.. ow, nvm, i'm dead") or getting tunnel visioned or not watching the back of my healer, but practice is the mother of all knowledge, you'll get the hang of it. And perhaps, like me, you'll soon find out that there are few things in game as rewarding as looming over the beaten corpse of your enemy... and cannibalizing it. Hmmm I care too much. And I'm a poor loser. There's too much losing in PVP (I mean, even if you're doing well you can expect to lose half the time). That said I encourage people to have a go at PVP on their character. Especially when they think they know it all, or that raiding is only pushing 2 buttons. It gives you a totally different perspective on your abilities and you quickly learn that something with a 2 minute cooldown can be used every 2 minutes or you might never use it at all. I'm not afraid to Pain Suppression tanks on weird trash pulls now. I'll even PS a tank going into that raptor boss in DTK. I've had a couple go splat the first time I've been feared so there's no reason not to use it imo.